By Riya Bhattacharjee, Scott Budman and Joe Rosato Jr. 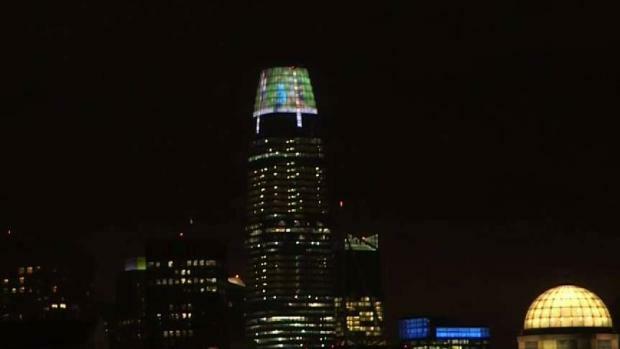 The Salesforce Tower in San Francisco opened for business back in January, but the skyline-altering skyscraper was christened with an official grand opening ceremony Tuesday morning. 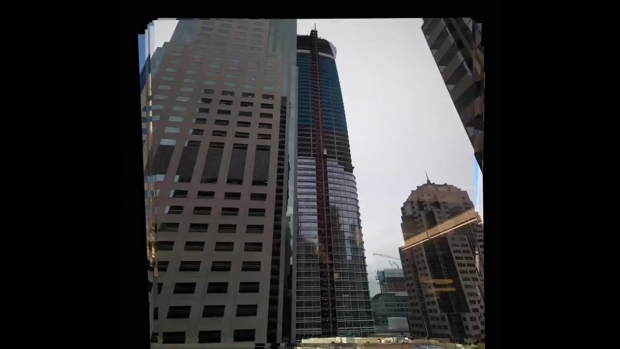 Stretching into the sky at 1,070 feet, Salesforce Tower is now the tallest building in San Francisco and the tallest office building in California. It is currently the second tallest building on the West Coast, behind the Beverly Wilshire Grand Center in Los Angeles, which opened last year. The company celebrated the event by having a dancer from the famous San Francisco musical "Beach Blanket Babylon" sing with a hat showing off the City by the Bay's famous landmarks — which now includes Salesforce Tower. There was also a Michael Jackson cover band. San Francisco Mayor Mark Farrell, former Mayor Willie Brown and Salesforce CEO Marc Benioff spoke during the ribbon-cutting ceremony about the project's success. But Benioff also addressed the city's economic divide and the thousands of homeless people who are living on its streets every day. The Salesforce Tower in San Francisco opened for business back in January, but the skyline-altering skyscraper was christened with an official grand opening ceremony Tuesday morning. Jean Elle reports. "Our unemployment in San Francisco stands at 2.1 percent ... the lowest in our city's history," Benioff said, before adding that "there are children and families sleeping in cars, couch surfing, sleeping in the streets some nights and hotels other nights." He stressed that technology companies have to take responsibility for their community. "We are part of the city’s fabric, how can we look away from it,” he said. "Every technology company has the ability to participate ... either through volunteering, to give employees time off to participate in the community ... also money, the ability to give money." Benioff said the company would use some of its profits to help the homeless community, adding that that Salesforce was donating $1.5 million to Hamilton Families’ Heading Home Initiative. He promised to help raise $200 million more to help provide services for the homeless. "I want them to remember there's people that are thinking about them," he said. At one point, a few people in the crowd yelled: "Benioff for mayor." On Tuesday night, the light installation on top of the tower — the nation's tallest public art − will turn on permanently. Designed by San Francisco artist Jim Campbell, the artwork will be located at the crown of the tower where the building rises 150 feet beyond the highest occupied floor. "I’m less stressed about it now and more excited because we’ve seen what it looks like with imagery up there," Campbell told NBC Bay Area in an interview. "I’m very happy with the visual results." Campbell is installing cameras at Ocean Beach, Golden Gate Park and along the Embarcadero. Each day’s images will create that evening’s projection — sort of like a daily civic diary. Campbell’s mind is already flying to other possibilities. One idea is to project the age of the building each night. Another: post a camera in an unusual location to capture daily life. After four years of development, Campbell spent the last month honing the installation on-site with unannounced tests that sent Twitter and Facebook into a tizzy as users posted pictures and videos of the illuminated tower. The test images have included video of crowds walking along Market Street, a soccer game and ocean waves. For the first year of the project, Campbell will be involved coordinating the images daily. But as prominent as the installation is, Campbell said it’s intended to fade into the skyline. "I’m not designing something for people to go look at," Campbell said, "I’m designing something for people to notice when they happen to glance over at it." Fun facts about the #SalesforceTower - the tallest building in San Francisco: — it’s 7 ft taller than the Eiffel Tower. — it’s as tall as 3.5 Statue of Liberties stacked on top of each other.